Add Fern Cottage to your news feed. 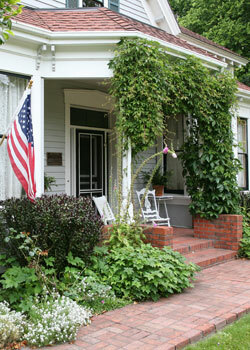 Fern Cottage is one of the few homes in California lived in by the same family since the 1870s. Weddings, events and group tours are welcomed year around. Call for a reservation. Fern Cottage is a wonderful place for family gatherings, birthdays, anniversaries, meetings and other special events. In the fall of 1852 Joseph Russ hired two vaqueros and drove 100 head of cattle over the coast range to Eureka, where he sold the cattle to the army. In 1854 he married Zipporah Patrick, who lived in Sacramento after crossing the plains with her family in a covered wagon. They bought about 50,000 acres, most of which is still ranched by their descendants.